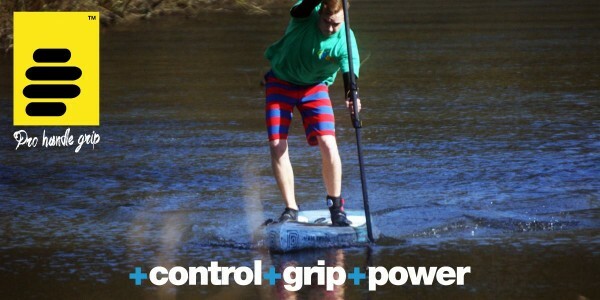 With ProHandle Grip, however fit or unfit, you can paddle further, faster, safer, and you will in most cases, be delighted by the improved comfort of existing injuries or problems which prevent you fully enjoying this wonderful way of being on the water! 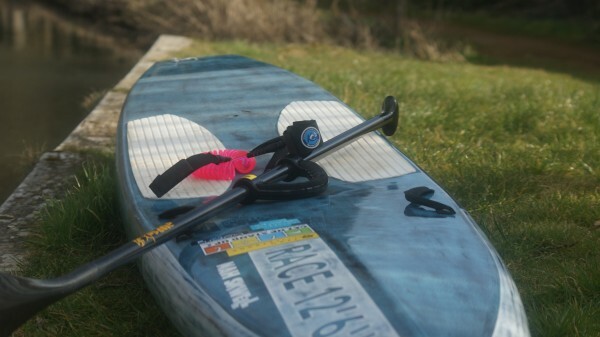 The Pro Handle Grip or EPS (Ergonomic Paddle System) is an elegant and disarmingly simple solution to the problems facing many Stand Up Paddleboarders who choose to paddle for exercise, competition, or socially with family and friends. So what's it actually all about? Simply put, ProHandle Grip's product turns almost any standard straight shaft paddle into a crank shaft (or bent shaft) type, to improve your bio mechanical efficiency to not only deliver more power, efficiency and performance, but significantly reduce the risk of R.S.I. type injuries which plague so many sporting activities like SUP, which most of us undertake for fun and fitness! Crank shafts have been a thing in kayaking for many years, and there are a few knocking about in the SUP world, but there are drawbacks with price, durability, position and what is feasible to actually make, meaning that they remain the preserve of a very few dedicated paddlers, who often own several paddles specifically made for them and very specific uses! The benefits of the ProHandle Grip might initially at least, seem to be one of cost saving (i.e. you don't need to buy several paddles both crank and straight), but the reality is, that with the PHG you can fine tune the position to perfectly match your build, paddling style and characteristics of the paddle you already have, while also getting far more 'crank' than is currently possible without compromising the shaft strength. 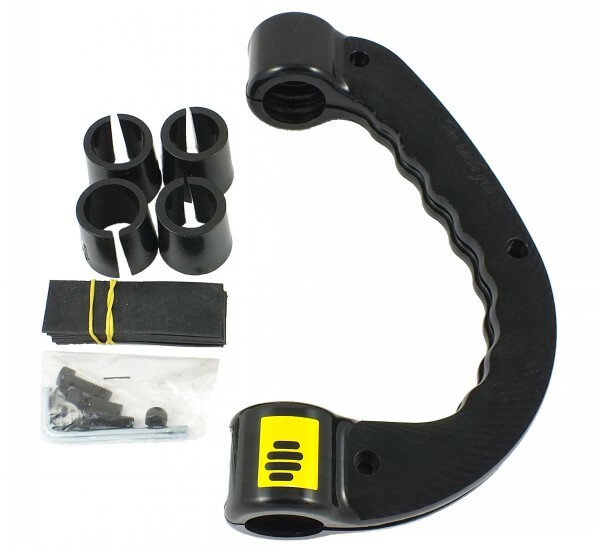 This is just like having a great pair of running shoes or a bike frame made/set up specifically for you, all of which help to put your body in the best position for Skeletal/Muscle alignments ensuring minimal loadings of Joints, Tendons, Ligaments and Muscles, making them all work more smoothly for longer - the ProHandle Grip when set up for your build and equipment, used sensibly, will give most people these same benefits without the huge cost of custom/tailor made items! The extra degree of crank for the lower hand, along with the adjustability of the handle distance to the T handle on the shaft enables 'custom made' type of matching to your particular physiology. This in turn sets in motion a whole series of advantages, with increased reach for the 'catch', better lateral control of the blade for better acceleration, significantly improved alignment of the wrist/elbow/shoulder joints and much more efficient use of the muscle groups associated with these critical joints. The paddler quickly finds that they are able to still achieve good reach while standing more squarely, thus reducing the tendency to twist from the lower spine, which also encourages a lower top hand movement, with much more even use of the abdominal 'core muscles' and the lower back as well as triceps and biceps - Keeping a lower top hand position significantly reduces the risk of rotator cuff and other very debilitating shoulder injuries! The use of the PHG will not eliminate all potential R.S.I. problems, or turn you into a super man or woman overnight, but when combined with other sensible approaches to sustained exercise like stretching and warming up, avoiding a very high shoulder movement and twisted body to get maximum reach and paddle drive (this is the thing that is doing a lot of the damage with the top racers I believe), then even a modestly fit person, maybe already carrying injuries and a degree of arthritis can paddle very successfully, and gain considerable Cardio/Balance/personal well being benefits from SUP! Fits virtually every paddle from every manufacturer! The Handle weighs 160g and is a really lovely 'clamshell moulding' in high strength Nylon, held together with just 3 x 6mm A4 grade Stainless Screws and Nyloc Nuts with an Allen key provided (note, Allen Key is of course Steel, and in spite of the plating, will rust unless carried in a waterproof pouch and not handled with salty fingers). Lovely moulding and elegant design make it really easy to fit and adjust, taking about 5 min's for most people. For your first go, I think it's well worth picking a flat day, then just paddle around a few hundred meters, then pop ashore to adjusts and keep adjusting until you get the perfect set up for you, as we have found that although the factory recommendation is a an excellent starting point, everyone will have slightly different preferences. 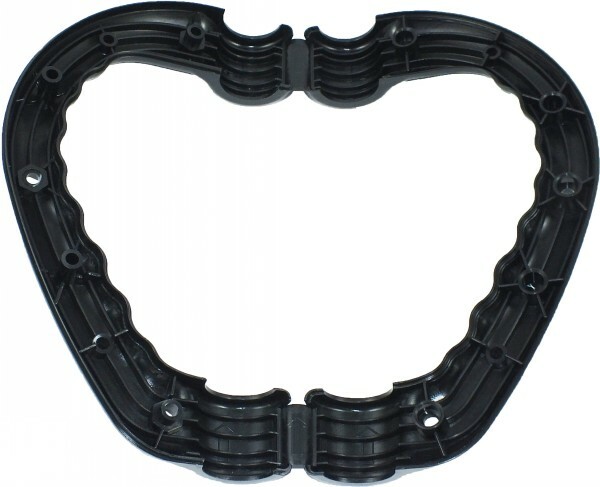 Available in Black, Yellow or Orange, there are moulded round bushes for shafts of 28 to 31mm and flat neoprene strips for use with Oval shafts from 27 to 33mm included in the box - 1 pair of these strips can also be used with bush (trimming 1) for 26mm Round Shafts - depending what bushes or strips you use, these will bring the total weight up to about 200/220g. Supplied by Pro Handle Grip and edited into English by Kai Sports Ltd, 7/1/15 E&OE. Injuries to the muscle-skeletal system during physical activities are largely avoidable. When these occur, some damage may be affecting (alone or in combination), muscles, tendons, nerves, joints and spinal cord, reducing the effectiveness of the physical activity itself. To reduce the onset of such issues (besides the correct preparation of the athlete prior to exercise), it's necessary to establish an effective postural strategy during the repetitive movements of the limbs, trying to distribute evenly the weight and efforts over the entire body. Additional benefits during sport and work activities are provided by the use of aids and materials with ergonomic properties that allow reduced wastage of energy, an optimal distribution of workload, and the limitation of muscle-skeletal injuries from overuse. 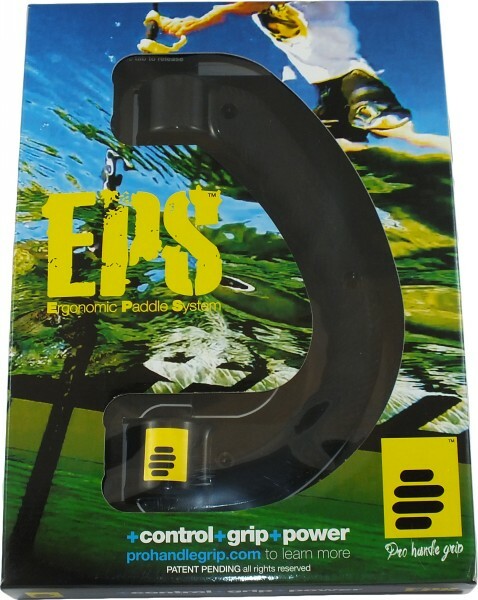 All sports persons using paddles or oars may find postural benefit from the innovative ergonomics of the 'Pro Handle Grip', hence forward referred to as the Ergonomic Paddle System (EPS). 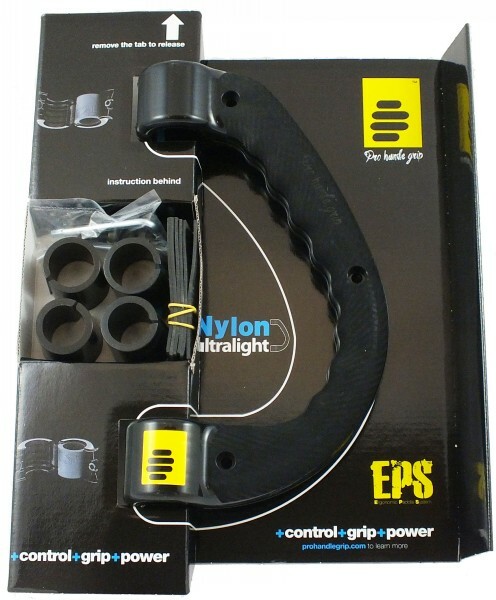 EPS allows a better grip by the hand due to the mandatory flexing of metacarpal-phalanges joints, phalanges, proximal and distal inter-phalanges joints, with thumb in opposition, thus increasing the capacity for water load and therefor greater traction. This ergonomic hand grip allows the user to also maintain in line the radio-carp and mid-carp joints, reducing the movements of counter-resistance responsible for micro-trauma of triangular fibrocartilage complex (TFCC) and the ulnar collateral ligament of the thumb (UCL); similarly reduced are the inflammations of tendons of the wrist and elbow, as epicondylitis, epitrochlear inflammation, Quervain's Disease. The correct hand grip offered by EPS is recommended for the prevention of the Pump Arm Syndrome and for reducing damages to the shoulder; in addition it allows a better balance on the board which ensures the uniform distribution of load-unload forces on the inter-vertebral discs during the postural sequences, likely to reduce the risk of pain or injury in the lower spine. A correct regime of stretching and warm-up before any sporting activity, and the avoidance of excessive workout remain a useful recommendation to avoid or reduce the risk of injury.